Dating Expert reveals "The 12 Frogs of Christmas – Men to Avoid if you Want a Happy Holiday"
The holidays can be the most glorious and romantic time of the year. But for millions of single women, it can be a lonely time of the year. And even worse than being alone – is being with the wrong guy. Relationship expert Marilyn Anderson warns women to beware of "The 12 Frogs of Christmas – Men to Avoid if you Want a Happy Holiday". 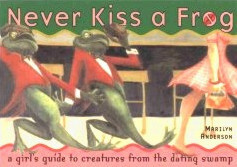 Anderson is the author of "Never Kiss a Frog: A Girl’s Guide to Creatures from the Dating Swamp." The holidays can be the most glorious and romantic time of the year. But for millions of single women, it can be a lonely time of the year. Nonetheless, relationship expert Marilyn Anderson advises women that it’s better to be alone than to be with a FROG – a man who WON'T turn into a prince no matter how many times you kiss him! SCROOGE McFROG - He’s fine up to and through Thanksgiving, but the next day when Christmas shopping starts, he’s all “Bah Humbug.” He thinks Christmas is crass commercialism and a waste of time and money. In fact, he puts the hex on all your Xmas activities. Tell him to hop on his sleigh and sled back to his lily pad! FROSTY THE FROGMAN – Maybe he doesn’t actually have ice flowing through his veins – but in the feelings department, he’s below zero. If you’ve been together over a year – and he’s never said “I love you,” check him “off” your Christmas list. THE FROG OF CHRISTMAS PAST, PRESENT & FUTURE – This is the guy who’s always there, he’s just never there to say “I do.” If it’s your 5th Xmas together and when you open your gifts, there’s no ring to decorate your finger – it’s time to re-decorate your love life. With this frog, Jingle Bells will never turn into Wedding Bells! Marilyn has appeared on over 100 radio & television shows and at speaking engagements across the country with her unique blend of comedy and advice. She was the Dating, Flirting & Kissing Coach on ABC’s “Extreme Makeover.” Marilyn is the author of "NEVER KISS A FROG: A Girl’s Guide to Creatures from the Dating Swamp." PRODUCERS...for an entertaining and informative segment for the holidays - call Marilyn now. MAGAZINE & NEWSPAPER EDITORS... "The 12 Frogs of Christmas" is available as a complete article. Availability: California, nationwide by arrangement and via telephone; available as a last-minute guest.